Your most pressing questions about the bakery, answered. When Janis Smith opened her bakery in 2010, she had a great vision for what she wanted to do. Create beautifully crafted cookies using traditional methods and recipes she had been dreaming about for years. She wanted to use real ingredients, old-world craftsmanship, and human power to create cookies that were downright unforgettable. Her initial vision has never wavered; to consistently create exceptional baked goods that deeply satisfy even the most discerning cookie connoisseur. The inspiration came from a cobblestone lane located in Norwich, England. It has many small, independent shops dating back centuries, and still attracts tourists to the area today. Janis fell in the love with the area, and decided to name her cookie venture after this nod to a simpler time. Our cookies are created in a unique square shape as a reflection of our no corners cut philosophy; from how they are made, to what we put in them, to what we leave out. All of our bakery items are prepared using fresh natural ingredients. That means doing it old school and leaving out all artificial colours, flavours and preservatives. An Elm Hill cookie is hand-cut (dust them for prints if you don’t believe us) and baked daily in small batches. We wouldn’t have it any other way, and we hope you feel the same. Drop, in we’ve got the oven on. The smell of shortbread , ginger, chocolate and all things amazing can envelope you before you step inside. 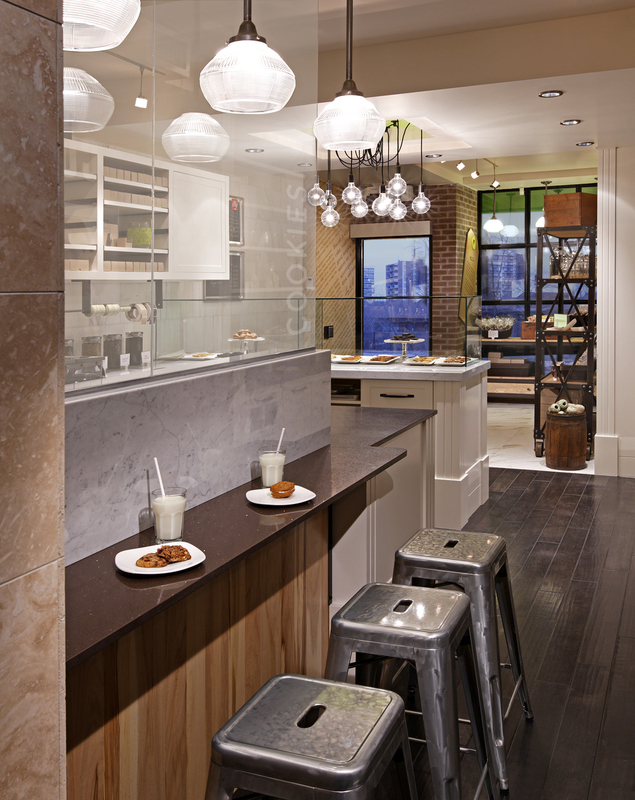 Once inside our door you will see shelves stocked with cookie jars, fresh leaf teas and cookies on a stick. One look in the display case and it may be love at first sight. With an ever-changing array of gorgeous cookies, the decisions you have to make are downright impossible. With some small tables by the window, feel free to stay a while and bring a friend. An Elm Hill cookie tastes even better with a hot cup of tea and great conversation on the side.